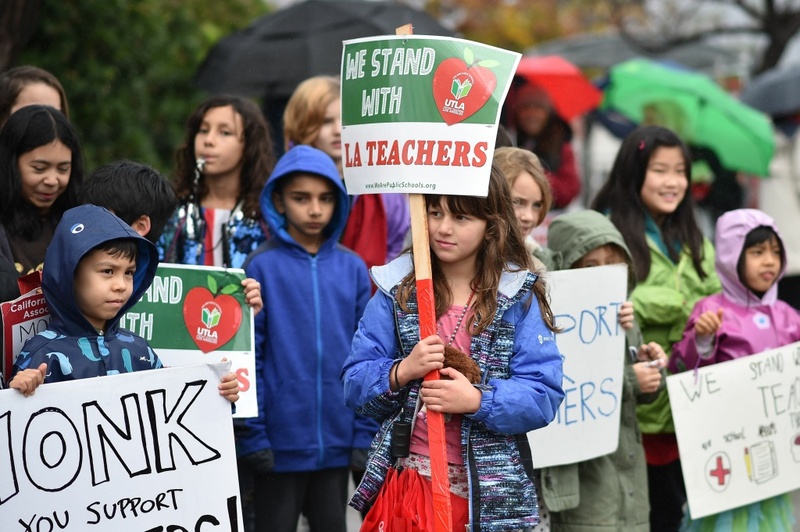 Students pose for a snapshot after walking the picket line with their teachers and parents on the third day of the teachers' strike, January 16, 2019, outside Dahlia Heights Elementary School in the Eagle Rock section of Los Angeles, California. Earlier this morning, Mayor Eric Garcetti, alongside UTLA President Alex Caputo Pearl and LAUSD Superintendent Austin Beutner, announced a tentative agreement to end the teachers’ strike. The deal includes lower class sizes, community-based schools, improved support staff and a salary increase for teachers. Teachers will return to work and normal classes will resume tomorrow, should the 34,000 members of the teachers union vote to approve the deal later today. LAUSD update: contract approved, charter moratorium resolution passed. What’s next?